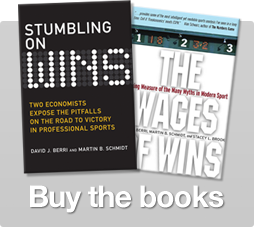 Led by Faried, the Nuggets, now 47-22, boast seven players who rate above average in win production – one more than the Thunder have – according to data from David Berri, an economics professor at the University of Southern Utah and co-author of the book “Stumbling on Wins,” which chronicles win shares in various sports through statistical analysis. “Faried doesn’t fit the (superstar) profile,” says Berri. “But he hits the shots he takes and he rebounds.” By Berri’s reckoning, Faried has produced 9.4 wins for the Nuggets this year. Right behind him is guard Andre Iguodala (8.1 wins), who scores just 12.8 point a game but who rebounds well for his position and averages two steals per game. Point guards Lawson and Miller have both contributed over five wins, while unheralded center Kosta Koufos (60% field goal percentage, seven rebounds in 23 minutes a game) has added 6.6 wins. If you are interested in finding up-to-date productivity stats, we’ve got you covered! The NBA Geek has both team and player Wins Produced stats that are updated once a day. We’ve also written a lot about the myth of the 2004 Detroit Pistons, the Carmelo Anthony trade, and Kenneth Faried — for more, search our archives using the search box at the top of the site. 2 Responses to "Forbes talks Nuggets, Melo with Dave Berri"
I desperately need a Karl Watch about last night’s game. I need closure.